In March 2013, nine BBC students worked tirelessly for the residents of Los Fierros, Nicaragua – a remote town an hour from Managua. As part of alternative Breaks, the students laid the foundation for a classroom in an overpopulated preschool that serves 90 students; the school previously only had three small rooms. Maria Reynaga, Margarita Menon, Leah Santos, Nicole Balastegui, Cheryl Conteh, Gary Santos-Mendoza, Nate Edwards, Boris Mercado and Hector Arroliga worked for five days non-stop, battling extreme climate changes, physical exhaustion, and a daily hour-long commute on an unpaved road to and from the site. The FIU group was charged with phase 1 of the project. Other university groups – coordinated by Panorama Service Expeditions, a travel company that specializes in service projects in Nicaragua – will take over where FIU left off. Reynaga and Arroliga are already scheduled to return to Los Fierros this summer to continue the work they started. The students take a break from digging the footing trenches around the perimeter of the classroom. The students, who are active participants in FIU’s Center for Leadership and Service, are pursuing a wide-range of degrees, from a bachelor’s in hospitality management to a master’s in higher education administration. Despite their perceived differences, they share a passion for service and commitment to making a difference in the world. For seven months, they raised the funds needed to pay for their trip to Nicaragua as well as the materials needed to build the additional classroom. 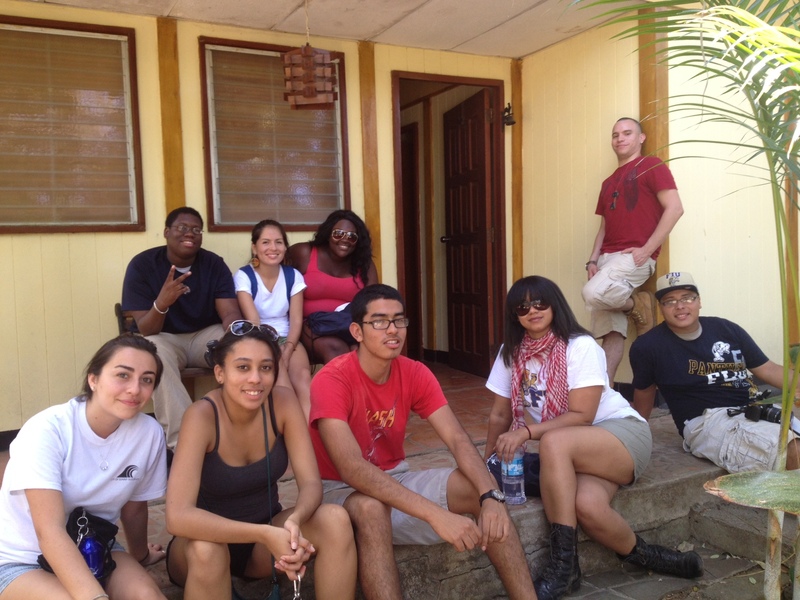 The BBC students were among five groups that traveled to Nicaragua during the spring session of alternative Breaks. The collective group represented the largest contingency sent to a single country in the organization’s 17-year history. Below is the second video in a series chronicling the journey of these students.